Uncategorized Guest Post and Giveaway with Sonya Bateman! Guest Post and Giveaway with Sonya Bateman! I recently asked the lovely (and funny!) Sonya Bateman, author of Master of None, to write a guest post for me. She graciously agreed, and I’m so excited to welcome her to the blog! In addition, one lucky winner will win a personalized, signed copy of Master of None (provided by Sonya), so be sure to fill out the form at the end of the post! She’ll also be stopping by the blog throughout the week to answer any questions you may have, so feel free to post a question for Sonya in the comments! Giveaway will run through 1/31! Thanks so much for having me over, Kristin! I have a confession for you: sometimes, I really hate mycharacters. This shouldn’t be a problem. I’m the creator, and all I’msupposed to do is decide that now it’s time for *this* to happen, and it does.I type a few words and off things go, just the way I want them to, ininteresting and compelling directions. Only when it comes to the middle of the story, this Does NotHappen. Donatti: You’re doing it wrong. See, this guy should be deadright now. Ian would kill him as soon as he saw him. Ian(Djinn): That is correct. Excuse me, I have a monk to murder. Ian: He is, as you humans say, toast. Me: Don’t even think about it. I told you, I… wait asecond. Ha! You don’t have his tether. You can’tkill him. Donatti: No, she’s right. But there’s no way in hell we’rebringing him home. Jazz: Damn straight you’re not. Me: Jazz, you’re not even IN this scene! Jazz: Well, I should be. You just don’t like femalecharacters. Me: That is so not true. It’s just that Donatti’s the maincharacter, and this is in first person, so he gets more page-time. Robert Gray: Ishould be the main character. I’m more interesting. Me (and everyone else): Who the hell are you? Robert Gray: You cut me out of the first book. Remember? Me: Will you all justbehave and do what I tell you to? I’m in charge here! Of course, this doesn’t reallyhappen. I’m not crazy enough (yet) to believe my characters have somehow acquiredminds of their own, and are carrying on somewhere without my input orknowledge. I’m sure there’s some fancy, scientific explanation about thesubconscious mind, the id and the ego, the complex intricacies of the humanimagination and the way neurons fire in the brain. But I’m not a scientist. I’m just a writer, with charactersthat refuse to behave. Fortunately, they’re usually right, and I end up loving themagain – it just takes me a while to see that. You can download Sonya’s Ebook, The Getaway, for only $1.99 at Smashwords! *The Getaway features sample chapters from Master of None and a longer exclusive excerpt from Master and Apprentice not available anywhere else! Look for the next exciting Gavyn Donatti adventure, Master and Apprentice, available March 29th from Simon & Schuster! giveaway, guest post, master of none, signed book, sonya bateman. Break of Dawn (Vampire Babylon 3) Giveaway Winner! This was such a funny interview. I can just image that this does happen with some writers. this is great! I haven't read any of your books but they look amazing! What inspired you to write your books? Lisa, they drive me crazy sometimes, they do! Kristina, if you get a chance to read, I hope you enjoy them! I have never read your book, but I'm going to put it on my to be read list that is for sure! I haven't read anything for a long time with the djinn (Castle in the Air, was the last one possibly the only one now that I think about it). What made you bring the djinn into your book? That was a great interview, makes me want to read the book to see all of these wacky characters in play. I'm not familiar with any of these. Thanks for the heads up! I'll have to check them out. That was probably the weirdest interview that I have ever read. Ever. And I loved it. So, what does that make me? Sonya and her books sound like a lot of fun! I'm glad I checked in today. Thanks, Shera! I like wacky! Peep – that is a very high compliment for me. 🙂 I love being weird! I laughed out loud when l read this! It's so funny and l really really love how characters come to life you could sometimes imagine them doing this!! What education did you take to help with your writing career? How coincidental! I added this novel to my wishlist just this morning when I tripped over mention of it somewhere online. It looks interesting…thanks for featuring it and giving me more of an idea of what it's all about. The use of djinn makes me happy. The novel I've allowed to lapse on my hard drive features them, so I'm ridiculously excited to seem them being used in an urban fantasy. What a nice change from the (now almost cliche, alas) vampires and werewolves. Ha! Sonya…That interview…wow…let me just say you have definitely caught my interest…It seems like you have just as much character as your, well…characters lol. I'm so glad I stopped by today and got to check it out. I'm entering the giveaway but just set an email alert to remind me to buy them if I don't win! "give me a beer please"
"He's a Hottie(or slang equivalant of such)" lol! Great post! I've had characters do this to me–it's nice to know I'm not the only one! Sonya-It's been an absolute pleasure! Oh, this is a great post! I really would hate to be in your head while all this is going on. Sounds like it gets a little hairy. 😀 LOL! Thank you for the great post. I have this book on my want list, but some how it's been there a little to long. Thanks for reminding me about it. Thanks for the guest post interview! I was wondering if you got to design or choose your covers or if the publisher picks them? Thanks for hosting – hope to win – I would love to read Master of None! Thanks for hopping by the Paperback Princesses. Have you managed to solve the knitting/reading at the same time problem yet. Let me know if you do! LOL! This interview cracked me up! Thank you so much for this wonderful opportunity! What is your writing mantra in 15 words or less? Thanks. By far one of my favorite character interviews. Ever. I see that you have to deal with a lively bunch but, is there one character that gives you a harder time than the others? Thanks for stopping by and letting us take a glimpse into your head. Winning would be cool but, if I don't I'll definitely keep an eye out for this book when I'm out in the wild. Ohmygod, this was so funny to read! Hi Curly – I'm sure you were talking to Kristin, since I can't knit. *G* But hello anyway! Jen, my biggest troublemaker is definitely Ian. He's naturally cranky anyway, so getting him to behave is like pulling teeth! Sonya, that is a very good point! You could never be bored. 😀 lol. Thank you! Thank you so much for following my blog! Your blog has so much stuff on it, it will take me a while to get through it all! But it looks great! LOL! Loved the guest post! I like it when characters feel the need to speak their mind. It's always entertaining! I absolutely love reading these interviews! Great guest post! It's fun to see how the characters come alive and misbehave for you! Haha so funny to read! I have been seeing this book reviewed all over the place. .. I've been wanting to read this book. Reviews I’ve read so far have been great,Sonya. I can’t wait to read it. thanks for the great interview. funny character discussion. i loved it. interesting to read, that your characters get boring for a while. i guess that's a real challenge there – getting over the first big excitement & then continuing to write. The interview was great…can't wait to read the book! Great guest post,I was unsure if I was going to read these books but now I just have to. All I have to do now is decide how I'm going to read them, ebook or paperback. Gconoy, I guess the middle of a book is notorious for being a writer's Molasses Swamp. Sooo easy to get stuck! Indeed it was a fun interview. Thanks for taking out your time to do it! Have a grand weekend coming. Thanks for the interview, it was hilarious! I especially like the part where Jazz shows up!! 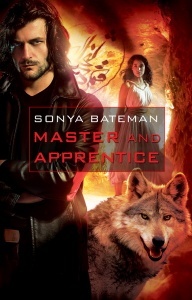 Oh, and I love the cover of Master and Apprentice! Hi Sonya, have you ever considered writing books for young adults? This is the first time I saw this book. I wonder how the story is. Sonya, what is your writing quirk? Thanks, Mad Scientist, and a happy weekend to you! Would love to read Master of None. Great interview and giveaway. Thank you very much! I love the idea behind this book. Sounds like it would be a great read! Thank you for taking the time for this interview. I love finding books I haven't read before.